Cordes Express wrote: Ritchies 526, InterCity vehicle. Seen operating School service thru Waimauku to Helensville on Thursday morning. They must have been short of buses. The Helensville depot was empty when I went past. optares will be cascaded down to their school fleet..
runcimans 1110 at the rugby museum,palmerston north.note this location is approximately 2kms south of 1110's birthplace--- coachwork int!!! a period of transition at northbus in whangarei. Seen early this evening near Katikati, a broken down tag axle "Valley Flyer" being attended by Rowes (of Tauranga) large salvage truck and a smaller van - presumably a mechanic from somewhere. Couldn't see the number clearly as my view was blocked by a large truck but could have been 2400. What was a "Valley Flyer" doing on State Highway 2 heading in the direction of Tauranga? Wrong turn?? Lost?? Ex ARA, ARC, YBC, CTL, Redbus, GoBus And now???? I can see ex-Northstar 22 ex Hong Kong B10M! The Green is slowly starting to disappear. OLYMPIAN wrote: I can see ex-Northstar 22 ex Hong Kong B10M! Ritchies three ex Northbus Hong Kong Volvo's are all now in Christchurch. can anyone confirm that older buses(12+ yo old) at GObus have been retired from hamilton urban services??? ka9102 wrote: can anyone confirm that older buses(12+ yo old) at GObus have been retired from hamilton urban services??? The fairfax bodied O305's are still in service. These include 86, 87 and 88. 81 to 85 have faded away with most, or all in Tauranga. The MCV's are slowly coming into service. Spotted 1107 in service yesterday along with 2 others. The days are very much numbered for the golden oldies. Yes we have the Designline Merc 0305's (fitted repowered with MAN SL202)81,82,83,85 (84 still on cards getting rebuilt with Gobus 544 Engine and Trans) in our Tauranga depot eith mixed with ex CBS (Gobus Christchurch)Optares and Zhong Tongs we slowly getting rid of japs buses in our depot also our depot slowly like getting jammed all theses buses from Hamilton and Christchurch buses and we go like our 2013 MAN 16.250/E5's from 921 to 924 for Bayhopper Tauranga from replacements of Plaxtons Primos from 772,773 and 779 i heard grapevine if Gobus success get Tauranga for another 5 years on tenders i heard that getting more Hopper buses like our 900's Series and slowly get rid of 4 more Plaxtons Primo's to Gizzy Bus Services in Gisborne and keeping 2 for Tauranga like 777 and 778 to stay in Tauranga. Hamilton's public transport network has now officially become fully accessible. The Merc O305 low floor rebuilds and older MAN's have been withdrawn from service. Go Bus has introduced 10 new MAN 15.250's with MCV bodywork. Other than Tauranga it's the only city that I'm aware of that is now fully accessible? gowest 1859,1861,1862,1863 have been "sold" to ritchies in whangarei!!!!! The Go Bus urban fleet is slowly but surely being painted from green all over to white. Also Go Bus 89 a 2011 MAN 16.240 with Designline bodywork has been doing urban services in Hamilton. 89 was originally based in the Hawkes Bay. On the 16th December the new AT livery will be launched along with the three Link services rebranded in a new AT livery for each service still retaining the Red for Citylink, Green for Innerlink and Orange for the Outlink. From what I have heard there will be a public display with Ritchies and H&E displaying a Bus each in the new AT livery. Also from after this date all NZBus Buses that are repainted will be repainted into the new AT livery. 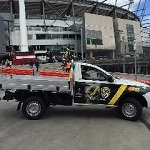 All other operators will eventually follow suit when the new PTOM contracts are rolled out over the next two years. 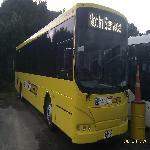 Bayline Coaches of Tauranga has been taken over by Uzabus. Pavlovich Coachlines have ADL #4003 reg. GFR766 based down in Hamilton in busit Silver/Green livery. Bus has been renumbered #2059. Also on another note all CNG buses are out of service in Hamilton. Go Bus have starting rebranding their urban fleet into a new standard livery, much a like what's happening in Auckland with AT blue and silver. The silver looks a whole lot better than the blue and silver up over the hill. Go Bus 1103 is the first MAN 15.250 in the new silver/green livery. Peter,Is that rumour a buyout of GO BUS existing contracts,or a retendering exercise by the Bay of Plenty Regional Council ?? It has been announced that NZBus is the preferred tenderer in the recent tender rounds for the Western Bay of Plenty contracts which come into affect in December. I'm posting this here as I can't seem to find a 'historical' bit. Has anyone got any information on the 3 ex UK London Country AEC RP Reliance coaches exported and rebodied I believe by Hawke in the early 80,s? I rode on RP80 which I think was the second conversion the day it was retired. I remember doing some research on the AEC RP Reliance coaches back in about 2004 period. I traced all three and my research was that only the AEC Reliance chassis came to NZ and not the Park Royal bodies. I did trace the one converted to a mobile home, found and visited it in 2004, in the Katikati area north of Tauranga and photographed it and it was a Bonnici body. There was a 2nd one at McGraths Coaches in Tauramanui (no longer a company in existence), also photographed it in 2004. The 3rd one was at Barriballs in Stratford Taranaki. I have emailed pics to you via the address given on BusAus......if you don't get them contact me. Last edited by Ribble on Tue Nov 27, 2018 6:07 pm, edited 1 time in total.